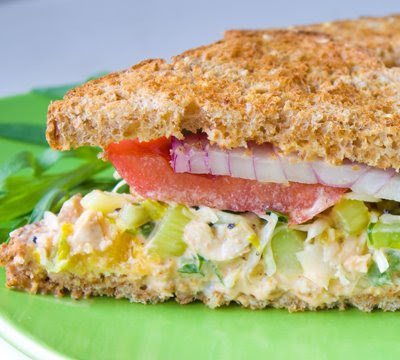 Top Ten Summer Sandwich Recipes! No-Cook Meals. 1. Healthier Club Sandwich: Built for Two! So big it's built for two! With vegan tempeh bacon and three layers of multi-grain soft toasted bread. This twist on the classic club will leave your tummy growling! 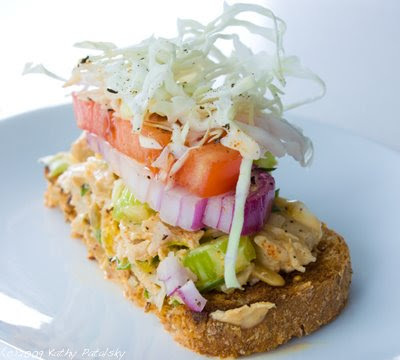 This open faced crusty sandwich, a signature of mine, is so pretty that it's hard to eat it! But once you take a bite you will be in creamy mango bliss. 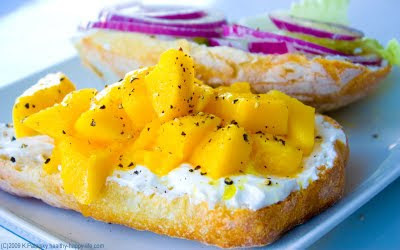 The crisp ciabatta bread combines with cool vegan cream cheese and sweet juicy tart mangoes is the perfect combo. The added red onion gives it a zesty kick. Heavenly. This is a recipe that accidentally came together when I had some leftover pesto from my Lasagna Verde. But the result is a unique and yummy combination that tastes like you are eating the sunshine of Italy and the Tropics combined! Spicy green pesto meets creamy juicy mango with a sweet Vidalia onion to send you to sandwich dreamland. Classic crowd pleaser with a vegan twist:vegan Jack cheese and tempeh. Super portable and super simple. You can't go wrong with this fresh from the farm tasting sandwich. This was a knockout hit sandwich for me in the winter when persimmons or fuyu's were in season. My simple advice: substitute summer fruit. Peaches, apricot, plums or even strawberries. Oh my, my mouth is watering just thinking about a "summer berry" cream crusty! Check out this vegan barbecue shredded style sandwich. It uses Trader Joe's pre-packaged BBQ shredded pouch. So fast and yummy. Perfect to please a big hungry crowd in a snap. Blows the BLT out of the water! This pita stuffed full of smoky tempeh, mache lettuce (very healthy green), and a thick summer tomato is the perfect summer sandwich. Light yet high in protein, super healthy too. Sliced peaches, cream cheese and some crisp greens. Untraditional yes, but a delicious way to add some fruit to your food. Breakfast sandwiches watch out. You've just been demoted to inadequate because of the presence of this brunch muffin! Fresh herbs, smoky tempeh bacon and vegan cheese and layered between a whole wheat English muffin. So perfect for brunch, even better for a brunch picnic! 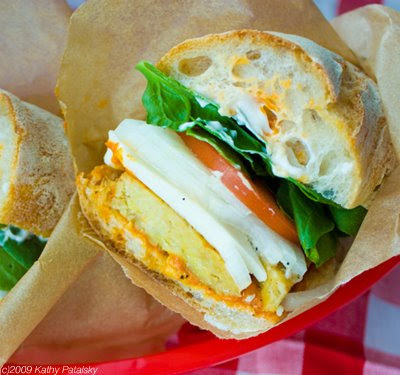 Check out more vegan sandwich recipes here. Sandwiches!